Check the blog for this month's Deal of the Month! 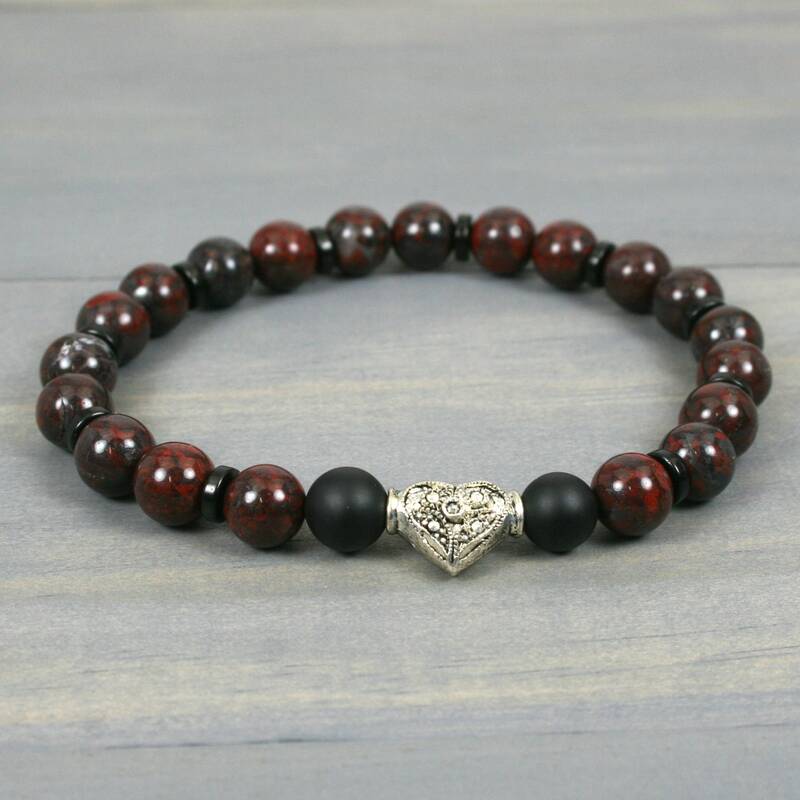 This bracelet is made from 8 mm round brecciated jasper stone beads, 8 mm round matte black onyx beads, an antiqued silver plated heart focal bead, and black coconut wood spacers. They are all strung on a sturdy stretch string for an easy, clasp-less fit by sliding over the hand. The knot that closes the loop has been reinforced with glue for additional sturdiness. 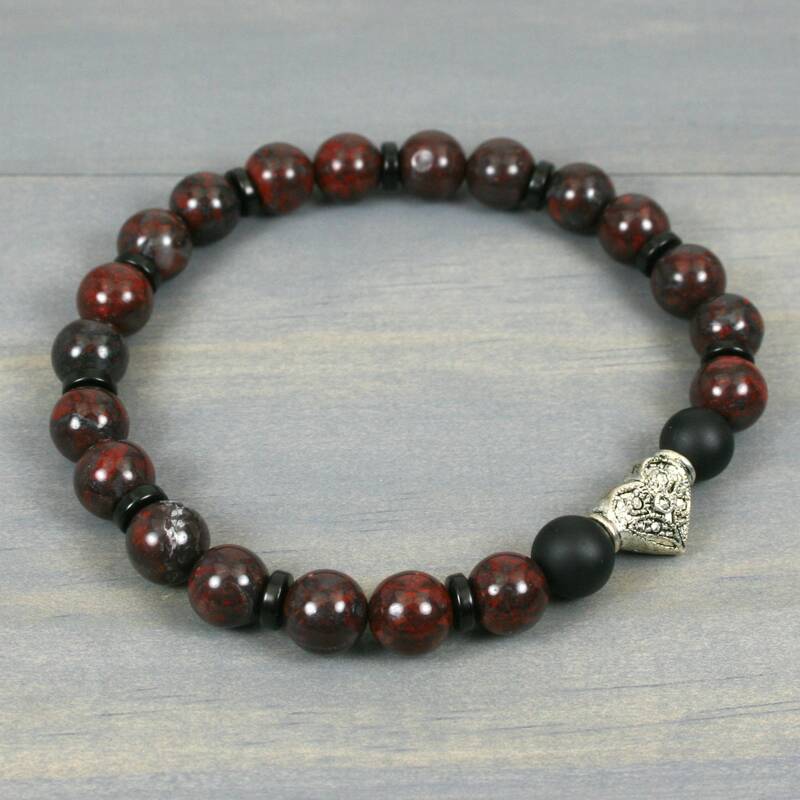 Brecciated jasper (sometimes also known as poppy jasper in its lighter colored ranges) is a natural gemstone that consists of swirls of deep brown, brick red, and cream colors. This is a natural stone and may therefore vary in color and patterning from specimen to specimen. It is known for promoting vitality, focus, and grounding. As shown, it is sized to an inner circumference measurement of just over 7.25 inches where it touches the wrist (see image 4). 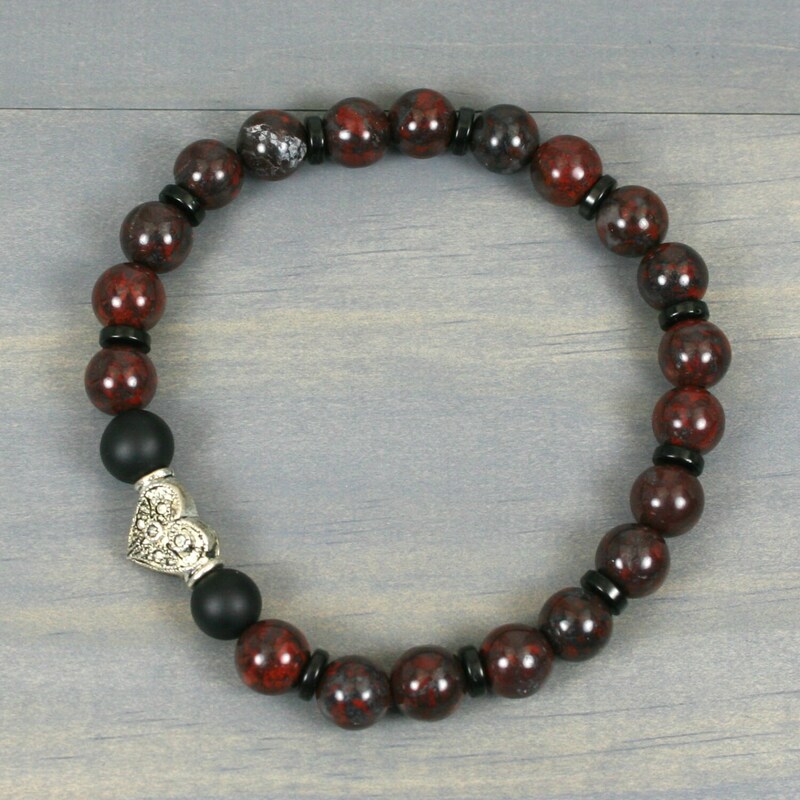 The size can easily be adjusted with the addition or subtraction of brecciated jasper beads for no extra charge. If you need a different size, leave a note with the size you desire in the comments area of your order, and I will re-size it for you prior to shipping. 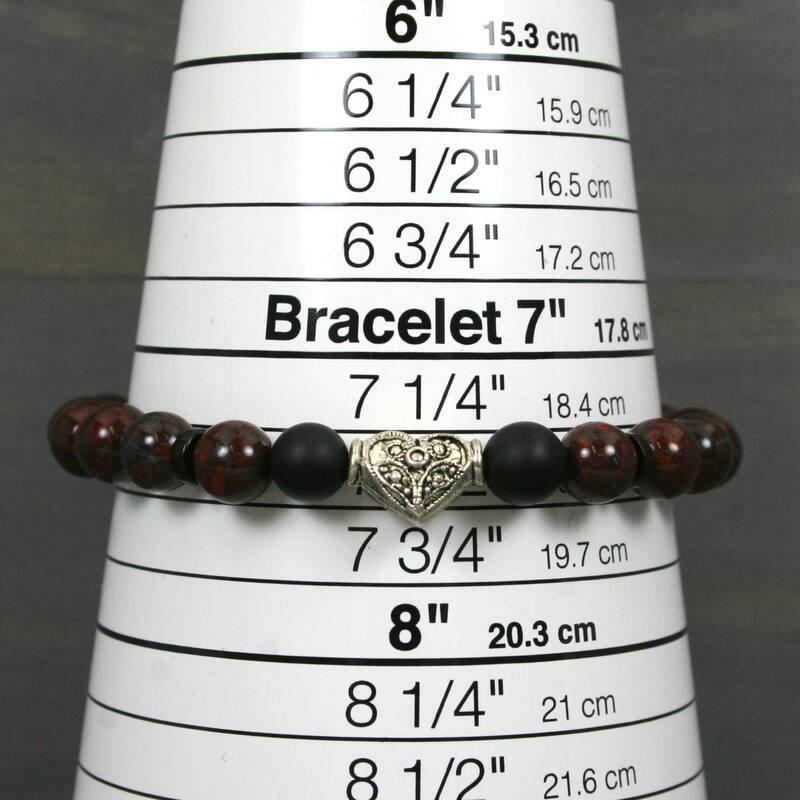 To determine the size you need, wrap a non-stretchy string or cord around your wrist at the place where you would normally wear this bracelet at the looseness at which you would want this bracelet to fit on your arm. Mark the length of string/cord needed to wrap that fit and then measure it on a ruler or tape measure for the inner circumference measurement needed. Although I have done my best to photograph the color of this item accurately, please allow for variations in monitor settings and for the fact that the photo is taken under high powered lights. This item comes in a gift box suitable for gift giving. Please read our shop policies including frequently asked questions and shipping information by scrolling to the bottom of this page. I do not use any information from my Etsy shop for marketing or newsletter purposes at any time. To be notified by email of each month's Deal of the Month, you must subscribe separately to our newsletter via MailChimp at http://eepurl.com/dFF5An. You may unsubscribe to this newsletter at any time, if you no longer wish to receive them. * Service providers. I engage certain trusted third parties to perform functions and provide services to my shop, such as delivery companies. I will share your personal information with these third parties, but only to the extent necessary to perform these services. * Business transfers. If I sell or merge my business, I may disclose your information as part of that transaction, only to the extent permitted by law. * Compliance with laws. I may collect, use, retain, and share your information if I have a good faith belief that it is reasonably necessary to: (a) respond to legal process or to government requests; (b) enforce my agreements, terms and policies; (c) prevent, investigate, and address fraud and other illegal activity, security, or technical issues; or (d) protect the rights, property, and safety of my customers, or others. * Access. You may have the right to access and receive a copy of the personal information I hold about you by contacting me using the contact information below. * Change, restrict, delete. You may also have rights to change, restrict my use of, or delete your personal information. Absent exceptional circumstances (like where I am required to store data for legal reasons) I will generally delete your personal information upon request. * Object. You can object to my processing of some of your information based on my legitimate interests. In such cases, I will delete your personal information unless I have compelling and legitimate grounds to continue using that information or if it is needed for legal reasons. * Complain. If you reside in the EU and wish to raise a concern about my use of your information (and without prejudice to any other rights you may have), you have the right to do so with your local data protection authority. Buyers are responsible for any customs and import taxes (including VAT) that may apply. These are not included in your payment to Etsy, except for Australian customers. Please make sure you understand your country's customs policies and costs prior to ordering. Beginning July 1, 2018, Etsy will collect GST for Australian customers for orders less than or equal to $1000 AUD. Finished items will ship no later than the next business day after the order is placed. 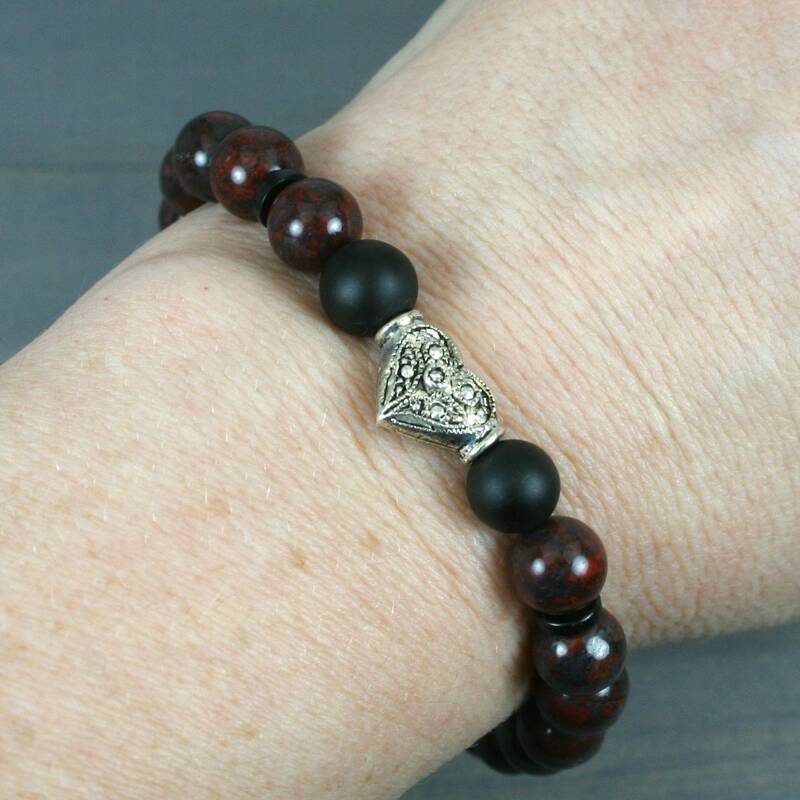 Custom orders and made-to-order items will ship as soon as they are completed. A time estimate will be provided during the process of creating the custom order listing. Due to the volume of orders that I am currently processing, I cannot delay shipment of an order beyond the shipping time frame specified for that item. I apologize for the inconvenience. What if I have entered the wrong mailing address for my order? If you send me a corrected address before your order is shipped, I can fix the address before printing the shipping label. Once the package has shipped, I cannot make any corrections to the address. If the package is returned to me due to an incorrect or invalid address being supplied, I will notify you of the return and refund your purchase price. Shipping charges are not refundable since those charges will already have been paid to the US Postal Service. If you wish to re-order the item(s) using a corrected address, you may do so after they are re-listed for sale. I am not responsible for packages that are mis-delivered due to an incorrect address being supplied by the buyer. Please use care when entering this information! Which countries do you ship to and which shipping carriers do you use? In addition to the US, I currently ship to the following countries: Australia, Canada, France, and the United Kingdom. If your country is not on the list, contact me to inquire about the possibility of adding it to the list. Will my package come with tracking information? All packages will be shipped with tracking information. For international orders, tracking is updated while the package is moving within the US, but whether the tracking is updated once it leaves the US varies greatly depending on the procedures of the national postal service of the country to which it is traveling. I have no ability to track or trace a package once it has left the US if your country's national postal service is not updating the tracking information you see here. Contact your country's national postal service with questions about your package after it has left the US. You must report the non-delivery of a package to me within 120 days of placing the order for a refund to be considered. Can I send an order to someone else as a gift? Yes, enter the name and address of the person to whom you would like the gift sent in the shipping address portion of your order. If the recipient of this gift will be in the UK, please make careful note of the instructions in the first FAQ in this list. It is important to let the recipient of the gift know to expect this gray card and that they will be required to pay these charges in order to receive the package. Gifts sent to other international destinations may encounter similar customs charges due. Please be sure to research the customs procedures in the country to which you are shipping the gift and notify the recipient, if necessary, about what may be required of them. What if I have not received my order? All shipments are shipped with insurance. If you have not received a domestic shipment (USA) after more than 20 days from the date of shipment or an international shipment (outside the USA) after more than 40 days from the date of shipment, please notify me, and I can file an insurance claim to get you a full refund. You will need to verify your lack of receipt to the insurance company using a link I will send you in order to qualify for the refund. All insurance claims must be filed within 120 days of the shipment to be considered for refunds. Shipments that are rejected by the recipient or that are returned unclaimed by the national postal service of the country to which it was shipped will receive a refund of the purchase price only. I accept custom orders in order to design a new piece or modify an existing jewelry item or accessory to better meet your needs, but I do not offer personalization (for example, engraving of initials or messages) of any kind. To initiate a custom order request, please use the Request Custom Order button in the left sidebar to discuss whether your request is one that I can fulfill. Do you have sales, discounts or coupon codes available? Check the shop Announcement area at the top of this shop's home page (https://EarthwearCollection.etsy.com) to check out our Deal of the Month for this month. All items included in the Deal of the Month are listed in the On Sale section of the shop. To be notified by email of each month's Deal of the Month, subscribe to our newsletter at http://eepurl.com/dFF5An.